Well Guess what guys i Went back to open Championship and chose the trustworthy Little Mini and i Won the Finish Rally and managed to stay 1st in overall for a Little while that is until Monte Carlo, Wales, and Greece came up and that pesky gnarly German Rally well Sweden is still alittle bit of a challenge before i begin getting green instead of red but i am more Confident now i can flat out the mini and sometimes break and take the 2´s, 1´s and sometimes i just throw it around using the handbrake but almost all 5´s and 6´s i flat out in the Mini. I now need a good car to start managing Clubman rallyes they are longer 6 races/Rally and different weather conditions i didn´t manage to get past Clubman earlier today but i will because even if the online events give some cash clubman also gives some more cash. I am to much of a Noob to get any serious Money from Daily events and monthly but i guess i need to keep at it, and the Rewards will come, only thing is that Championships becomes to get one sided as it is same tracks over and over, that is why Codemasters should give both console players and PC players some DLC more Rallies and cars. But i guess that isn´t their main thing right now one can hope in the future but who knows. Daily's dont pay much even if you are in the top flight...monthlys are the highest paying. Just do custom championships...you can race to your hearts content. As for easy cars to drive, IMHO the R4's are pretty easy, 2000s and 2010s are also not that hard, while they are fast, they also have good brakes (espcially 2010s), so they can also stop on a dime. The R4s might be a bit slower than Group A (although I'm not sure about that), but anyway you should get used to the speed, because all of the 4WD cars are gonna be fast, ok, well, coming from a Mini, pretty much anything's gonna feel very fast. I can spank my 2000's times with my Integrale, maybe that puts things into perspective. Like people before me have said, don't aim to win straight away. It took me a long time to win the Masters championship. I've surpassed 500 hours on the game, and I'm still learning some of the cars. I'm not sure if this has been said in previous posts, but assists slow you down, so try to avoid using them! EDIT: Science has been done, turns out I'm a dummy! Saturation has been at 100% since I installed the game so I never changed it, the Sensitivity setting is at the top and that's the one I set to 60%. Oops, guess I got the two words mixed up. Sorry for the misinformation, what Ryu said is correct. Sensitivity and linearity should be preference. DR doesn't have a sensitivity slider though, I think sens/sat are combined. I'll do some science right now and report back. well Finland i do pretty ok but Wales , monte carlo, greece even in the mini i have very difficult to get some good times no matter how many times i drive them i never get any hairpins or other tight turns to work. i try the hand brake but then it takes forever to get going again. i did try the BMW M3 in Monter carlo i was every where with it the thing that bothers me is when i have taken a slow turn and i accelerate it starts flying fom left to right to left or just does a 180 it is very annoying how do you guys get a grip with that kind of behaviour? You've just got to learn to modulate the throttle; it takes practice but the M3 is actually a very good car to learn on due to its linear power delivery. Don't use full throttle till you know you've got grip, once you learn when the car bites you can start adding more and more throttle each time until you're comfortable with where the car's limits are. As for the Mini, the handbrake tends to really kill what little momentum you have, so on tarmac it's better to just drive the hairpins instead of sliding through them. If you are needing some grip into the corners, tap the brake a little while still keeping the power on, the weight will transfer to the front wheels without losing much speed and power, its all about balancing the throttle and brake. 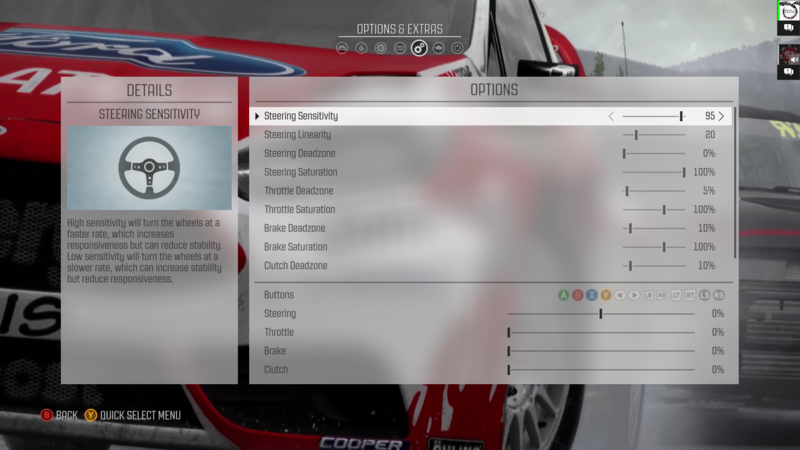 Especially with RWD cars, half the steering is done with the steering wheel, the other half is with the throttle. I'm in a similar situation to you (played many many racing games including the Forzas, GTs and the old CMR games all the way back to ps1, pre dudebro era) and yes this is my first post on here as well! First thing I did is the 1st thing I do in every racing game all assists off. I bought the Alpine first got annoyed with it if I recall until I softened the rear suspension which stopped the twitchiness a bit and won a championship. Thinking "yeah hard game my bottom" I then bought an F2000 306 Maxi (was thinking FWD and more power easy job) and literally couldn't do the 1st stage of Finland in it. When I say couldn't I smashed that thing to smithereens about 20 times before buying forza horizon 3 and putting this on a shelf. Five months later I'm back at it after watching the WRC early rounds. I took on my nemesis, I decided to drive it at 5/10ths got to the end of the event with most of working car in 3rd. Then managed to string a 3rd place championship finish together and I'm starting to enjoy it. Decided to stay at the same level/car and run the longer version of the championship (now 6 stages an event), was very surprised to finish Finland staying shiny side up the whole time and finish 2nd! Just had a my first fist pump moment as after a hard final stage on Greece (spun twice) I expected to be at best a distant second, then discovered the event leader who'd been 4 seconds ahead binned it and my 4th on stage got the victory. Possibly the hardest racing game I've played in a long time but it certainly seems to be rewarding. Also tried a few faster cars and looking forward to them polo wrc is a different league to my 306 in terms of speed and stability. When I first drove the 306 I could't keep it on the road if my life depended on it. I decided to "tame the beast" by doing a full championship with it (I think it was Elite difficulty at the time), and it was one of the most rewarding experiences I've had in a racing game. I came 2nd overall, and the 306 is now one of my favorite cars in the game. Learning cars in this game is very different to other games since they all provide a unique driving experience, they aren't just stat sheets with wheels. There are a few that are better or worse than others, but really you can do well with any car if you get to know it well enough. I'm nowhere near elite difficulty..*cough*beginner*cough* but the 306 nearly got this game traded in. Nice to know it's not just me being inept and I'm glad I kept at it so far. At least sounds like whatever car I go with next may well be an easier ride, might save up for a wrc car but suspect it'll either be a Xsara (to take advantage of my French mechanic related perks) or I'll go full Mcrae in an Impreza. Do you mean the C4? There's no Xsara in DR, hopefully they'll be able to snag the license for it for Dirt 4. Try them all out in Custom Events, I personally like the 2001 Focus the best in the 2000s class. For some reason I keep seeing it as a Xsara, Cmr 4 flash backs perhaps. I tried the Polo out yesterday and enjoyed it/was surprised at how much on rails it felt but smashed the Subaru to bits when I tried it. Though that was last year so may be better now that I've had my 306 baptism of fire. Tbf just taking it easy having a break from Elite Dangerous so fun rather than rapid progress is the goal.